Enchanted: Forest of Light is an annual event in winter that is a treasure of the Los Angeles community! It is an interactive, nighttime experience where Descanso Gardens beautiful landscapes and forests light up to create a truly magical setting. Keep going past the “flower” garden, and you’ll stumble upon ponds and waterfalls lit up with colored lights, as well as Starlight Garden, a magical lightway lined with lanterns, which ends with giant lanterns that the kids have fun spinning to create patterns on the ground. If you want to rest and take a break, halfway through the one-mile walk through Enchanted: Forest of Light is a little cabin that doubles as a gift shop, with adorable twinkle lights surrounding it, along with lounge chairs to relax under trees, and a cart with whiskey cocktails! With the twinkle lights, and nothing but trees surrounding you it is truly a relaxing setting to get away, unwind and spend quality time with your loved ones. Throughout the other sections of the experience there are interactive light displays, such as the one pictured above where there’s lit stages around trees, and as you run across them the lights change color. Super fun for the kids! My daughter probably did this the longest! One of my favorite sections of Enchanted: Forest of Light was the Ancient Forest, where the area of Descanso Gardens with tall trees and greenery are lit up, and complemented with nature sound effects as you walk through. It feels as though you’re in a rainforest and not in LA County! 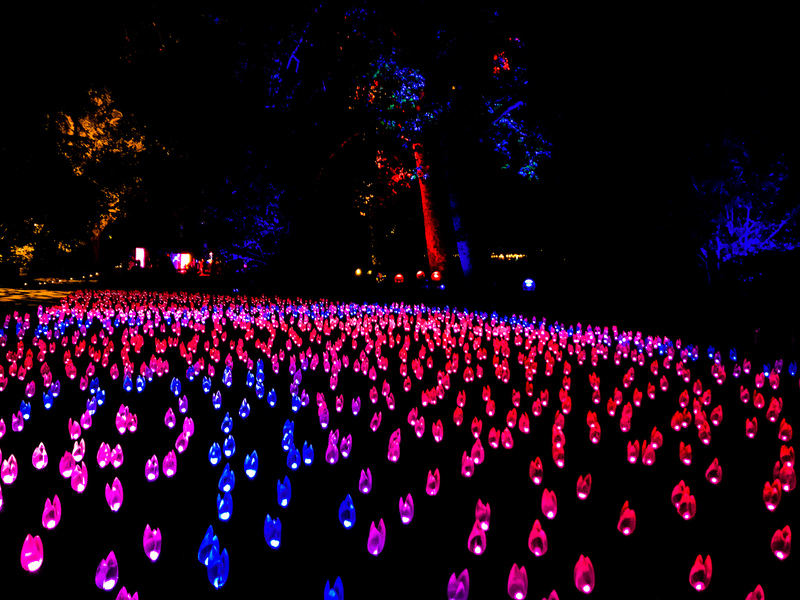 Enchanted: Forest of Light was a truly remarkable experience! It runs until January 6th. With tickets for many days already sold out, hurry and get tickets while you can to experience the magic for yourself!